Claim: Climate will hit Poor People harder than Rich People | Watts Up With That? Two separate studies have appeared recently claiming that climate will increase income inequality. In my opinion, both studies contradict readily observable evidence. Unmitigated climate change will make the United States poorer and more unequal, according to a new study published in the journal Science. The poorest third of counties could sustain economic damages costing as much as 20 percent of their income if warming proceeds unabated. States in the South and lower Midwest, which tend to be poor and hot already, will lose the most, with economic opportunity traveling northward and westward. Colder and richer counties along the northern border and in the Rockies could benefit the most as health, agriculture and energy costs are projected to improve. Overall, the study—led by Solomon Hsiang of the University of California, Berkeley, Robert Kopp of Rutgers University-New Brunswick, Amir Jina of the University of Chicago, and James Rising, also of UC Berkeley—projects losses, economic restructuring and widening inequality. Every year, major earthquakes, floods, and hurricanes occur. These natural disasters disrupt daily life and, in the worst cases, cause devastation. Events such as Hurricanes Katrina and Sandy killed thousands of people and generated billions of dollars in losses. There is also concern that global climate change will increase the frequency and intensity of weather–related disasters. Our research team wanted to know how disasters affect people’s decisions to move in or out of particular areas. We created a new database that covers disasters in the United States from 1920 to 2010 at the county level, combining data from the American Red Cross as well as the Federal Emergency Management Agency (FEMA) and its predecessors. Our work shows that people move away from areas hit by the largest natural disasters, but smaller disasters have little effect on migration. The data also showed that these trends may worsen inequality in the U.S., as the rich move away from disaster-prone areas, while the poor are left behind. Major natural disasters such as Hurricanes Katrina and Sandy cause numerous fatalities, and destroy property and infrastructure. In any year, the U.S experiences dozens of smaller natural disasters as well. We construct a 90 year panel data set that includes the universe of natural disasters in the United States from 1920 to 2010. By exploiting spatial and temporal variation, we study how these shocks affected migration rates, home prices and local poverty rates. The most severe disasters increase out migration rates and lower housing prices, especially in areas at particular risk of disaster activity, but milder disasters have little effect. What do I mean when I suggest both studies contradict observable evidence? Ask one question – how do cities cope with hot weather, sudden deluges and extreme storms, in places where such phenomena are already a regular part of life? Places like the tropical coastal cities of my native Queensland? The answer of course is the civic infrastructure of tropical cities is built to cope with the scale of events which are expected. The storm drains are built with much larger pipes, to easily cope with deluges on a scale which would severely flood most US cities. This is simply a matter of digging up the old pipes, and replacing them with larger pipes, next time the drains are repaired. The frames, walls and roofs of houses are built to resist cyclones, hail and extreme downpours – most of the roofs of working class houses in my area, including my house, are made of inexpensive heavy duty sheet steel. Such protection can be inexpensively retrofitted to houses at risk from storm damage – steel bracing to strengthen inadequate house frames, cheap steel roofs to increase protection from storm damage. Rich people sometimes choose tile roofs for aesthetic reasons – but they have more money to pay for roof repairs. In severe cases, people in low lying areas are evacuated if a cyclone or other extreme event threatens, with well rehearsed evacuation plans. The government steps in to help repair usually very localised extreme storm damage. Even a near miss turns a tropical cyclone into an inconvenience rather than a disaster, if your local infrastructure is built to cope with extreme weather. I am not suggesting that tropical cities get it right every time. 35 people died in the 2011 Queensland floods, a weather event so extreme it is believed to have caused global sea level to temporarily drop by 7mm. But this is far fewer deaths than the 1245 people who died due to Hurricane Katrina – a disaster which was reportedly exacerbated by poor planning and incompetence. Incompetence which costs lives only prevails while it remains hidden. Queensland authorities are not inherently more competent than Louisiana authorities. We have our share of public scandals and crooked land planning decisions. But severe weather in Queensland is a regular occurrence. If severe deluges or other weather events were to become more common in the USA, the people would demand solutions – and those solutions are not difficult to implement. If all else failed, the USA would simply hire top civic engineers from tropical cities to help upgrade US infrastructure, to provide US citizens with the same kind of storm resilience as people who live in tropical cities already enjoy today. July 1, 2017 in Alarmism. Note the narrative is changing. 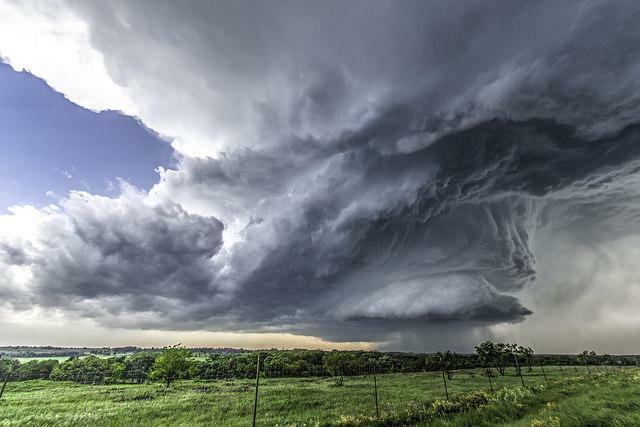 It is usually stated as fact that there will be ” increase the frequency and intensity ” of violent storms or that it is already happening “here and now”. Now it morphing to a “concern”. A more reasonable position. in the 2011 Queensland floods, a weather event so extreme it is believed to have caused global sea level to temporarily drop by 7mm. That link to WP sources the claim from the Guardian which cites a Falluso paper in GRL. The Guardian quotes him as saying rainfall in Queensland was “300mm above the usual rate”. First of all 300mm is not a “rate” , there is no time element given. Falluso does not know much about science. So if 300mm over Q’land ’caused’ 7mm drop world wide that must mean that the surface of Q’land is 1/42 of the total area of the worlds oceans. 361.9 / 1.853 = 195.30 cf 42 ! He has exaggerated by a factor of five. So Falluso makes this obviously stupid claim without even doing the most basic fact check to see whether it is credible. Try again, abstract and full paper available now. Never consider that he was misquoted about the 300mm. Interesting that you apparently trust the media. This article by Indur Goklany: Deaths and death rates from extreme weather events: 1900-2008 is available for download from your link. He is the author of several articles and books. Every visitor here should read this article, published in 2009.
resulted in enormous actual reductions in such mortality. Solid data presented to support the above. And New York came in second worse and both are touting “sanctuary cities”. What’s that tell you about Democrat/Liberal/Progressive/Socialist run governments? Both will be happy once they destroy the Capitalist economy that made them what they are today. I’m betting California wins that race to the bottom. And a significant part of that is better typhoon preparedness, evacuations and shelters in Bangladesh, the Philippines, etc. Many fewer people have died in recent severe storms (are they hurricanes or typhoons in that region?) in the Bay of Bengal, even though the storm severity has been no less. Why? Better countermeasures. Please support with links providing the data to support your claims. As if higher energy prices and fossil fuel starvation don’t hit the poor harder. Few of the millions of excess winter deaths are among the rich. Energy poverty won’t apparently, what an idiotic article. As you note, being too poor to afford high energy prices ain’t exactly good for the poor either, deaths by freezing if you can’t afford heating oil, gas, or electricity don’t hit the rich. But then, it’s an excuse to tax the rich, to take care of the poor, all the while keeping just a nominal handling fee as we take the money from one group and give it to the other. End of the world coming, poor and minorities hardest hit! Those SJW types don’t miss a lick. …..Just how much, do you reckon, is being added to the prices that the rest of us pay for medical treatment and other healthcare services by the taxes and fees that are levied on higher income medical doctors and other healthcare professionals who are producing and providing the services by our too numerous, too large and too costly governments? Is it our healthcare that so many can no longer afford or is it our governments who are no longer affordable? Or, is it maybe both with the costs of each being recycled into and driving up the costs and the prices that we are paying for the other? The here we go loop-ta-loop. That sounds like a sensible reader’s plea for smaller government. I agree…what is hitting the poor the hardest is the policies put in place by those who promote climate alarmism. Massive amounts of tax dollars are spent on wasteful intermittent generation devices, and then policies are put in place which replaces inexpensive sources with very costly ones. The net effect is a double hit to the poor and the middle class, who are forced to spend a larger amount of their incomes on basic survival, and on taxes to pay for the wasteful spending. We should all keep in mind that if the previous US administration had their way, their would have been no fracking boom and subsequent downward pressure on natural gas and oil prices. Their intransigence on the permitting of new pipelines was yet another way they sought to limit the flow of oil and gas to the markets, putting further upward pressure on energy prices. It is not climate change that hits the poor hardest…it is the policies put in place by the climate liars that do that. Adding CO2 to the air has put downward pressure on food prices by increasing yields, and if temperatures grew warmer, that would have the effect of lowering energy bills for a large percentage of the people in the developed world…since they spend so much money on winter heat. As usual with warmistas…the truth is the exact opposite of what they claim. Absolutely — there is no greater threat to income inequality than those who seek to extort trillions from the poor to pad their own coffers. “Current renewable sources of energy are not technologically capable of lifting hundreds of millions of people out of energy poverty. Consequently, the Breakthrough writers see “no practical path to universal access to modern levels of energy consumption” that keeps the projected increase in global average temperature below the Paris Agreement on climate change goal of 2 degrees Celsius above the pre-industrial level. … “forcing poor people to forego economic development in order to prevent climate change is a “morally dubious proposition.” They additionally observe that the wealth and technology produced by economic growth increases resilience to climatic extremes and other natural disasters. When bad weather encounters poverty, disaster ensues. Right you are, the WV Legislature, after several weeks of wrangling during extended Special Sessions, at extra costs of several hundred thousands of dollars, to pass a Budget, increased taxes on goods and services that will “hit the poor the hardest”. ” Climate alarmism will hit Poor People harder than Rich People”. On the same track I would have said ‘Reckless Spending on the Red Herring of Climate Change’ will hit poor people harder…. And another contributor above got it right when he said ‘Government is now unaffordable’, never mind anything else. The academic-government-Green industrial complex rob from the poor to give to the rich and themselves. While also killing them. CACA sc@msters rival Pol Pot as mass and serial murderers. Let their lo@x continue and they’ll move into the same class as H!tler, Stalin, Mao and Hirohito, although maybe will never make it to Rachel Carson’s level of mass murder. The rich need to do their historic part and hit the poor harder. The complaints about climate will dry up pretty quickly. …..The hardest (and the most blows) to the well-being of everyone — rich and poor — are being delivered by our too numerous, too large and too costly governments. This is all a round-about way of saying Trump voters will be hardest hit. I was raised in the rural, inland portion of Northern California, not far from where Anthony lives. Those counties all gave Trump a majority or plurality, as well as above-average votes for the Libertarian ticket. Are you talking to me? If so, get a grip. What you said sounds a lot like “hoisted with one’s own petard.” This is something that the CAGW people have done in their propaganda. If that’s not what you meant, you could clarify your intent and I could apologize. Ralph, You could just apologize, because his point was totally valid and bona fide. Washington based rich elites, aka Democrats, don’t care about fly-over America. They once a while mention poor people for the purpose of making an impression, but poor people for them are not the self-reliant people at the countryside. What they think when they say “poor people” is more like a minority representative, latin or black single mom, possibly gay, unemployed for sure, or employed in those low-paid jobs that are typical to lowly educated Americans. That Trump people are hardest hit by Democrats, is no wonder. When Democrats say “the poor people are hardest hit”, it is not because of climate change, but the coming taxing change by Democrats. It were funny if the poorest were not hardest hit by their unintended consquences. If they are unintended. Somehow I think hitting Trumpland is not unintended. Let’s look at policy and parties. 1) Who broke unions and pushed for right to work laws, which over the last 30 years has caused the % of the workforce that is unionized to plunge? Reagan. 2) Republicans for decades have championed free trade as a cure-all for economic growth (and Dems came along starting with Clinton). 3) The ACA has brought health insurance to 20M more people, including many of the working poor. 4) Republicans have fought against any increase in the minimum wage. Republican economic policies have been far more damaging to fly over America than Democratic economic policies. 1) What role did Big Union play in bankrupting railroads, auto manufacturers, airlines and, now, government? 2) How many jobs has international trade created? One example is new auto jobs in the South. How many in Detroit (see 1), above)? 3) How many insurance companies are exiting the exchanges? Has not Obamacare been cumulatively failing since its inception? 4) Minimum wage laws destroy jobs when overreaching. Nobody attempts to support a family on minimum wages as they exist. See what is happening to entry level jobs in the Democratic Party-controlled cities that have overreached with high minimum wage jobs. OK Hugs, if he genuinely was motivated by compassion for the poor, I apologize. What is so difficult to understand? Preemptive offence? If climate disasters don’t happen, nobody is going to get hit hardest. And the threat to low income people is government policies that raise regressive taxes to implement policies that won’t accomplish anything worthwhile. If Trump follows through on his promises, his voters will do a lot better than they would if he had lost. That’s not difficult to understand. Certainly unions in the 70s and 80s overplayed their hand. But a far bigger factor was deregulation. Actually, you have it backwards. When BMW builds a plant in SC, that has nothing to do with free trade agreements. It is done for 4 reasons 1) eliminate currency impacts on costs 2) to build goodwill in the largest auto market in the world 3) US labor costs are cheaper than those in Germany (and that is true in Detroit as well) 4) so that they won’t be adversely impacted if the US puts up trade barriers. So you have it exactly backwards. What does cumulatively failing mean? The fact that 20M people who did not have health care now do? Rather than take steps to fix the ACA, Republicans would rather kick 20M people off their health insurance. If it is overreached, I agree. But look at the flip side – most of the poorest states are in the South, which has the lowest minimum wages in the country, on average. Explain the logic of your position as it relates to that. I’ve answer your questions, now it’s your turn. Tell me 4 good things that Republicans have done in terms of legislation for working class people. 1) Who broke the unions? The unions broke the unions by being greedy and killing the companies they worked for. Right to work laws benefit workers. 2) Free trade isn’t a cure-all, but it does benefit everybody. 3) You really do believe your left wing propaganda. There never was 20M people without health care and more people have lost their health care because it’s more expensive than have been added to the roles. 4) The minimum wage hurts everyone. It doesn’t help poor people. The only thing that happens when the minimum wage goes up is that union wages increase, and poor people get fired. The ‘islands’ have an eerie resemblance to metastasizing tumors…..
Just another attempt of disinformation for the public. The desperation is thick. We are close to halfway to the so called 2 C danger point, and there are no discernible changes in weather patterns, nor in any critical climatic parameter. And don’t give me Arctic ice, glaciers, SLR, etc. B.S. There is nothing alarming going on. I assume that bad weather just doesn’t jump up out of nowhere at a particular point. We should be seeing negative impacts developing as temperatures rise. We don’t. Nothing unusual is happening. There is actually a noticeable decline in bad weather events, if anything. Weather related catastrophes have been around for millennia. Way before selective university grants pushed them into the limelight. Real mortalities from extreme weather events would include those tens of thousands of UK elderly folks who died of the cold last and previous winters. Not new, invented weather extremes, but simply lack affordable coal-fired energy. Hmmm… Increased atmospheric CO2 concurrent with good climate change. I like this development. Didn’t something happen with a hole in Uranus in that film? No, but Jupiter imploded into a star. Meanwhile, NASA does want to probe Uranus in search of gas. I would hop they are using long range sensing equipment when doing these probes of, um, that planet. I am so glad they are finally changing the name of that planet. and Roy Shnieder is gonna need a bigger space ship. Expensive energy which is unreliable such as wind farms and solar farms, make energy expensive for the poor. Traditional energy power plants such as coal, natural gas, hydro, and nuclear are much cheaper in the long run. Cheaper energy is what made this country (the good old USA) prosperous, and can do it again if it is allowed to. I support getting rid of wind and solar. Solar is good for calculators and watches and small appliances. Maybe wind would be good for pumping oil out of the ground…I can’t see that solar will keep your refrigerator, freezer, or electric stove, heat pump, or AC going for 24/7. I vote for cheap energy to fight the effects of extreme weather, (or if you want to call it climate change), cheap energy does a better job of rectifying or preventing it, by building prevention tactics such as dikes, and stronger buildings, etc. Wind and solar farms still rely on high subsidies/taxes and expensive backup systems to keep them goin. There may never be a way to inexpensively store electricity for use at night and when there is no wind. Wind in particular seems like a good idea until you look at the numbers (cost, life of the unit, down time, etc) and the bird deaths. And the strain on the grid. See especially points #8, 9 and 10 below. 5. Based on the evidence, Earth’s climate is insensitive to increased atmospheric CO2 – there is no global warming crisis. 6. Recent global warming was natural and irregularly cyclical – the next climate phase following the ~20 year pause will probably be global cooling, starting by ~2020 or sooner. 7. Adaptation is clearly the best approach to deal with the moderate global warming and cooling experienced in recent centuries. 8. Cool and cold weather kills many more people than warm or hot weather, even in warm climates. There are about 100,000 Excess Winter Deaths every year in the USA and about 10,000 in Canada. 9. Green energy schemes have needlessly driven up energy costs, reduced electrical grid reliability and contributed to increased winter mortality, which especially targets the elderly and the poor. 10. Cheap, abundant, reliable energy is the lifeblood of modern society. When politicians fool with energy systems, real people suffer and die. That is the tragic legacy of false global warming alarmism. Griff – you are a chronic source of misinformation. Everyone should just ignore you. UK bills are lower than in 2008, though we have more renewables. German bills are lower, as they use less electricity. Greens make electricity too expensive to use, and then celebrate when the poor stop using it. CHARGES are lower. Up front affordability (un-affordability) credit/waivers for an increased number of “poor” buyers are up significantly as well. Tell us there is no correlation. Still, on the other hand, we must make use of what is available. I don’t know about the climate, but idiotic responses and policies like increasing fuel and energy costs wil certainly hit the poor hardest as it uses up much more of their money as a percentage. Thousands of the poor and aged will die of cold quite needlessly..
“The elderly are useless eaters”. Few respectable climate scientists claim that it is possible, at present, to predict regional weather/climate very far into the future, from what I can tell. I may no be( am not) included in that group of experts, but I regularly follow the CPC’s climate(weather, actually) prognostications, and even out only a week or so, they can be at best, approximations – even if the models have improved.. The seasonal predictions for specific areas are even more of a turkey shoot and sometimes 180 out. Yet the alarmists try to claim accuracy out to 100 years! Notice they use regional down-scaling from the global models. Proven to have no accuracy at all. That’s really a good tact to use with people. Climate is simply trends in weather phenomena, so if weather forecasters can’t accurately predict temperature within 2 degrees two weeks out using models, what credibility can they possibly have predicting a 2 degree rise in temperature two decades out using models. First of all, this comes from model projections, not from observed temperatures and precipitation. Secondly, all forecasting was done using the worst-case IPCC scenario. Thirdly the models show no skill at all at regional forecasting, never mind their deficiencies at the global scale. Finally, and perhaps most importantly, Adaptation by humans is not allowed. Are these studies assuming a static population? What warming? Here they are again assuming facts not in evidence and then forecasting about the future based on an unproven speculation about CO2 and the Earth’s atmosphere. But they did say “IF” so I’ll give them that. Using “if” won’t make them look so dumb when this predicted CAGW warming doesn’t come to pass. All the CAGW claims like this should have a big “IF” featured prominently at the beginning, so as not to mislead the public. IF CAGW is real, then. . . Do it that way and at least you will be being honest about the situation. NOAA reports that 123.3 million people live on the coastlines of the USA. That number is to increase by 8% by 2020. If the NOAA and climate change scientists really believe their own predictions, why aren’t they creating programs to discourage the population from living near the coastlines? Maybe the authors of the studies could come up with a means test that only allows “rich” people to live on the coast, exposing them to the harsher realities of climate change and thereby balance out the hard hitting inequalities that they note in their study. that could work out if the government would also stop subsidizing flood insurance. I whole-heartily agree. At the same time do away with subsidized loans to support rebuilding in the exact same location. Latitude: if they do that, according to one Democrat Congressman, the island would tip over. Jeff. There are and have been in place dicouranging policys for living in costal areas in place for a long time. It is called high real estate prices and taxes. I liked living near the southern California coast with it’s great weather. I did tire of living like a refuge because of my income didn’t support the lifestyle I had been accustomed to. James Francisco, yes I realize that. However, Gulf coast states don’t have nearly that problem – especially those located below sea level. By the way I have a “refugee” friend who lives on the beach in San Diego and says pretty much the same thing as you have experienced. The cost of the Looney Left’s so-called “mitigation” will dwarf this dubious study’s economic effect while, at the best, reducing this supposed expense by less than 5%. Even if the warmists are right, which I find most unlikely, Carbon reduction is the most expen$ive and least effective method of dealing with this issue. Unless a mistake from my part, both sides of the argument seem to agree an infinitesimally small fraction of the outside air composition doesn’t drive the weather. But somehow, in the prognosticating computer programmes of the anointed, it turns into a planetary, multidecadal climate controlling knob. If there really were a fortune telling software, why not use it for resolving world poverty directly? Why many of the climate apocalypse prognosticators buy oceanfront properties instead? Even in hot places well-known for seasonal storms, such as Caribbean, Indian and Pacific islands? They should know better. Or perhaps the smartest already do, but haven’t found a better way to communicate the absurdity than to demonstrate it. With such climate “doom”, why are people moving AWAY from the NorthEast States and TO the South and West??? Census population estimates show that the 16 states and the District of Columbia that comprise the South saw an increase of almost 1.4 million people between 2014 and 2015. The 13 states in the West grew by about 866,000 people.. . .“Clearly, the Snow Belt-to-Sun Belt migration is coming back after a huge lull in response to the recession and post-recession period,” said demographer William Frey, of the Brookings Institution. I wonder what the full tally is of tax credits taken by the rich in the past 10 years for wind, solar, electric cars, hybrid cars, and now integrated solar homes with batteries and electric cars. Recall that tax credits are a direct subtraction of tax owed and the perfect end around to bypass the Alternative Minimum Tax that limits deductions claimed. That was also created by Dems. We are subsidizing the rich at the expense of the poor. This article is attempting to put a veil in front of our eyes. Basing a study on RCP 8.5 happening? That is about as likely as Louisiana not suffering more from political incompetence than the real effects of hurricane Katrina. Just another good reason not to be poor, not that anybody needed one. Yes, manipulate the poor and give them free phones to buy votes. They won’t do the audits on the program to find that half did not qualify based on income until you leave office anyway. This is another rendition of the redistribution of wealth formula embedded in the Waxman-Markey carbon tax bill. They never give up in Berkeley and Oakland. They get one thing right – the rich do move away from disaster zones, leaving the poor behind. Brace yourselves, my fellow “flyovers” – the steady stream of rich Leftist refugees from economic disaster zones like California, New York, Illinois, etc. is set to turn into a flood over the next few years. Let’s consider that Al Gore owns a whole lot of expensive coastal real estate. He obviously has a dog in this race and my guess is he’d like you and I to pay for a sea wall around his vacation homes? I heard it “women and minorities”. But it’s still funny. Climate change was there in the past, climate change is there now and climate change will be there in future. Unplanned urbanization making poor poorer, rich richer. Here the human greed is the primary cause for intensifying a extreme weather even impact. This is more so in developing countries where laws help them to violate. Rich are moving to the coasts and hilly areas and to get livelihood poor also moving to coasts and hilly areas. Decades back WMO published a document on natural disasters and impact on humans. In my city of Hyderabad, states one-third population live. Everyday tens of people die in road accidents. Most of the TV channels blare these events. Diesel truck over turned and engulfed with file killing more than 150 people. Even in pilgrimage hundreds of people are dying every year. This is very obviously wrong; poor people don’t spend money on vacations to Florida and Cancún. In general, they’ll benefit from a warming climate. We’ll just leave increased food production and lower prices as an exercise for the student. Honestly, I didn’t bother to read the abstracts or the press releases, because climate change is such a non-issue that I didn’t want to waste my time. Severe weather will continue to happen and the poor will continue to be the most vulnerable. A little bit of warming won’t have much of an impact. A little bit of cooling would be far more of a problem. A much bigger threat to the poor would be to raise the price of energy for the illusion of doing something about the climate. Higher energy costs make everything cost more and this would put a large and very negative burden on the poor, especially in winter, when many will no longer be able afford the energy to stay warm. This is a no brainer. ‘Doing something’ about preventing climate change is far worse for ‘the poor’ than any possible change in the weather. In fact, this is true for everyone, but the poor will suffer the most from carbon mitigation schemes. Bravo. + 1000. Why this obvious point is lost on progressive globalists continues to escape me. “…Why this obvious point is lost on progressive globalists continues to escape me…..” It’s because their goal has nothing to do with climate and everything to do with reducing humanity to the lowest common denominator. A good point. My answer is, it’s not lost, it’s merely step one in a dance I call “The Progressive two-step.” The proof that it’s not lost? When properly challenged (the dance partner, the prog. press never bothers to challenge an eco press release) they will admit this but skip to, “the extra revenue (from, say, carbon tax) will be rebated to the poor.” Somehow. Wonder why the poor aren’t clamoring for higher energy costs, don’t they trust the progs to pass the quan down? Then these same progs will explain how the poor don’t seem to vote “their” economic interests (iow, the interests progs have planned tor them). RCP 8.5 is the baseline. No wonder the alarmists are losing credibility. I guess examining actual data is no longer required. Why are people moving to the warm south if the cold north is going to become much more livable. I guess I should keep my summer home in Northern Michigan. I’m devastated by the fact IPCC only has business-as-usual. They should create a worst case scenario as well! By the way, this summer has been cold here. What did a friend of mine say about it? Well, she told it is because of climate change. Oh dear, I guess they will reuse their climate change scare if cooling really happened. Well this explains why the poor people are now living with water views in Manhattan, Florida, Sydney, Hong Kong etc and the rich people are now living in the Bronx, the bayou, Redfern and the western slums on Hong Kong Island. Low cost, reliable, and abundant electrical energy provides the greatest benefits to the poor. It means clean potable water, sanitation, healthier households, and improved hygiene. It provides the greatest economic, health, and personal leverage to the impoverished. In contrast to low cost, reliable, and abundant electrical energy, no other societal benefit yields as high a return, in both human and economic terms. With low cost energy, adaptation to variable weather can be accommodated, as the histories of England, the USA, Australia, and Canada have demonstrated. Draconian climate change regulations will make the United States poorer and more unequal, according to a new study published in the journal Political Science. The poorest third of counties could realize electric utility rates sustain economic damages costing as much as 30 percent of their income if warming regulations continue unchecked. States in the South and lower Midwest, which tend to be poor and hot already, will pay the most, with economic opportunity traveling overseas and to developing countries.Developing countries could benefit the most as health, agriculture and energy costs are projected to be lower without Paris commitments. Overall, the study—led by Solomon Hsiang of the University of California, Berkeley, Robert Kopp of Rutgers University-New Brunswick, Amir Jina of the University of Chicago, and James Rising, also of UC Berkeley—projects economic losses, constant restructuring, increasing taxation, massive increases in energy expenditures and widening inequality in Developed Countries. This statement reveals the true nature of Mr. Hsiang. He is a propagandist for the left; fear-mongering in an attempt to manipulate the population into surrendering to his ideology. There is nothing scholarly, or even truthful about his work. Wealth is not ‘transferred’ from the poor to the rich. Wealth is created. The rich are richer today than in anytime in history. The poor are also richer today than in anytime in history. ‘Rich’ people do not ‘take’ money from the poor in this country, unless they are rich politicians. The legitimate rich offer the poor goods and services that enhance their lifestyles. The poor freely choose to part with their meager funds for those things that will make their life easier and more enjoyable (like fossil fuel). A carbon tax is not one of those things. A carbon tax simply takes from the poor and gives nothing in return. The poor would not freely choose to pay a carbon tax. Mr. Hsiang uses the imaginary threat of a huge transfer of wealth from the poor to the rich to trick us into agreeing to a much larger and more certain transfer of wealth from the poor, middle class and rich to the pockets of left wing politicians and bureaucrats! Is Berkeley still a University, or has it become a home for the criminally insane? Way to GO! Got to Love the re-do! RCP8.5 is BS and they know it. Is it surprising that an alarmist model output generates, in the hands of these researchers and prognosticators, more alarming model outputs? One sign of ‘fake’ is the imputation that Hurricane Katrina was ’caused by global warming’ during a time lamented by the UEA as not witnessing any global warming at all. At the time it had only been eight years, but still, the putative link is without evidence. Suppose we uncritically take all their calculations at face value and reduce the RCP to a more realistic 1.0 degrees, the effects and outcomes predicted will be reduced by 88%. Meh. As for the prediction that the poor will remain but the rich will free, that is silly! The poor have nearly nothing to lose and can shift quickly away, just as the rural poor shifted quickly and easily to urban conurbations in the past. It is the invested rich who are reluctant to move. They are the same ones who hold ‘hurricane parties’ when a storm comes instead of sensibly leaving. They are ‘protecting their property’ in their minds. My thoughts turned to the Irish Potato Famine. In that case, we had a nation of poor, starving people in the mid 1800’s, before automobiles, planes and the wonders of fossil fuels. Somehow, millions of them managed to get passage to the United States to start a new life and hold big parades every March 17th! They made better lives for themselves in the States, and Ireland eventually recovered from the British telling the remaining residents what they had to do. Humans have always been adaptable, but now it is easier than ever, by a long shot. A gradual warming over the next 100 years would be easily handled by the anyone, including the poor. Our biggest threat, by a long shot, is ourselves! More specifically, we are threatened most by our fellow humans who seek to dictate how we must live. In this, we all have a lot in common with the Irish peasants of 170 years ago. well measure taken to mitigate alleged ‘climate change’ certainly hit the poor worse. Energy prices continue to climb. You do accept Paypal now dont you? Agitprop. It’s pointing out the blazingly obvious that ‘poor’ people will be ‘hardest hit’. They always are. Not because the system is prejudicial but because wealthy people live in better housing in better areas with more food, greater levels of protection and so on. It’s an apolitical statement of fact. Never stopped alarmists from using it to further their cause though. So called climate mitigation efforts have hurt the poor. Just look at the government mandated turning of corn into ethanol to burn as fuel instead of using as food. It has forced the price of corn up and made those that rely on corn as food poorer. Well, if the south is so horrible and going to be destroyed by too much heat, then why are people from cold states rushing to live in the hot states? Of the 10 states with the most influx of people (not percentage, but actual number of people), 6 are hot weather states. Like every claim of the CAGW cult, everything is based on their models and not actual, factual, verifiable data. The way I identify some scams is if THEY — whoever ‘they’ might be … ‘they’ could be Microsoft tech support, for example — tell you that you have a problem you did not know you had, but don’t worry because THEY can fix your problem for a fee. CAGW is a scam: They, the well-paid ‘scientists’ or well-paid bureaucrats or well-paid Hollywood elites, tell you that the earth is going to burn even though you would never know that if they didn’t tell you. But don’t worry, these well-paid individuals can fix your problem for a fee on your taxes and energy bill. The US needs to pass a law making it legal for residences of one state to move to another. Too many building code issues, not to mention giving legal status to an inanimate object. Just limit the new law to residents…. Just did a quick check and found no laws in US stopping people from moving from state to state. Are you talking about moving a house from one state to another? Buy an RV, problem solved. If you are talking about people moving between states, there are no laws stopping you from moving anywhere you wish. China and EU to issue formal climate change statement at UN. Should make for a hilarious WUWT post when it happens. After the recent disater in the UK where Grenfell Tower went up in flames, there is another fire that took place in Bow Wharf. Where a block of flats caught fire, and the suspected cause of the fire is …. Solar Panels I have not heard much from the greens about this, do all Solar Panels installed on buildings need to be checked for fire safety .. I don’t understand why “climate scientists” can’t start with a problem statement and develop reasonable solutions to that problem. Instead, they start with a solution and try to work backwards to determine how they can blame climate change. It’s such backwards logic, that I can’t even understand why everybody isn’t laughing at it. 1) Problem: Income inequality and energy poverty — Cause: World policies to restrict energy worldwide. Solution: Develop the least costly energy technologies worldwide to drive wealth in all regions. The added wealth should enable economies to develop environmental mitigation strategies. 2) Problem: Species Extinction — Cause: over-hunting/over-fishing, Invasive species, and habitat destruction. Solution — Conservation strategies to reduce hunting of threatened species and to incorporate habitats within populations have been the only successful strategies to combat species extinction. In addition, safe, inexpensive worldwide food distribution is vital to prevent the necessary exploitation of local resources for food. +10. They don’t start with a problem because there is no problem. We are witnessing the largest secular mass delusion since at least eugenics. All that we are witnessing is a projection of interior angst and bigotry and self loathing by the climate true believers. Of course there are problems. People are killed by heat stroke, flooding and other natural phenomena. During such natural weather events, those living in poverty experience much greater disaster than those in economically developed nations. It’s this jump from cause to solution makes no sense — especially without considering the harms of the solutions. This is like the FAA examining airline crashes and determining the solution is to increase the price of heating oil. We would never have developed a system with the dramatic drop in airline fatalities with that approach. These two articles are discussing “income inequality” — carbon taxes will make income inequality worse and make it more difficult for those who live in poverty to afford homes which can resist flooding or air conditioning. The “solution” makes the problem worse. Transferring wealth from people known to not have wealth is stupid. It reveals the political – not scientific – nature of the paper. “Our work shows that people move away from areas hit by the largest natural disasters, but smaller disasters have little effect on migration. The data also showed that these trends may worsen inequality in the U.S., as the rich move away from disaster-prone areas, while the poor are left behind.”. Their work shows that the authors did no work or critical reviews. In fact their work shows they wrote a useless paper but managed to get paid well for it. “Think of the children”. “Think of the poor”. “Think of the disabled (who can’t outrun climate change)”. “Think of the women.” Have I left any out? For Climatists, it’s all about the Guilt. Yes,,,it is all about trying to make us feel guilty, but it is just really stupid! Imagine that the laws of physics were abandoned and we really did have runaway global warming of say 10 degrees over the next 100 years. In order for the ‘disabled’ to maintain the climate in which they were born (a completely unnecessary requirement), they would have to wheel themselves north about 3 to 4 miles per YEAR! At least in Germany the “climate protection policy” (which is in reality a global redistribution of wealth) led to the fact, that the poor suffer more from “climate” than the rich. The poor can hardly pay their electricity bill, which has risen sharply because of the subsidies for “renewable” energies (mostly wind turbines) in which the rich have invested Billions! This CAGW madness, aka “climate change”, must come to an end! chancellor “Adolfine” Merkel calls non-negotiable! My theory is that all civilisations die when the collective stupidity reaches a tipping point. If this point is reached the society will collapse. I believe we have passed when the number of genders passed 2. The reactionary climate extremists are pulling out all stops. It us as if they are competing with each other to churn out the most deceptive inflammatory scary stories in defense of their apocalyptic delusions yet. The refusal of climate to actually do anything scary or unusual us driving the climate faithful a bit crazy. Like Heavens Gate believers seeking their seat on the starship, the climate kooks are willing to fabricate anything at all from nothing if it will support their delusional non-existent climate crisis. Yet the proposed solution to CO2 emissions by the climatistas – renewables – absolutely hammers the less well off with higher energy prices, removing yet another margin from their ability to live their lives, grow financially, and raise children. They also have the added benefit of being far less reliable, leading to brownouts and blackouts in the coldest and hottest parts of the year. Here’s a piece on flooding on Arizona Ave. in Atlantic City. This street is on a tidal flat. It has been flooding for forever, but this hit piece doesn’t mention that. Here is a USGS piece from 1960 showing the tidal flood areas in AC. Gore blamed Katrina on Bush and “CAGW”. Previous State and local Governments diverted Fed money from maintenance of the levies to other purposes. What’s the phrase? “A picture is worth a thousand words.” Well, this picture ain’t it. Huh? It’s antithesis to the very excuses and finger pointing by Gore, Blanco, CNN, etc. that you mention. 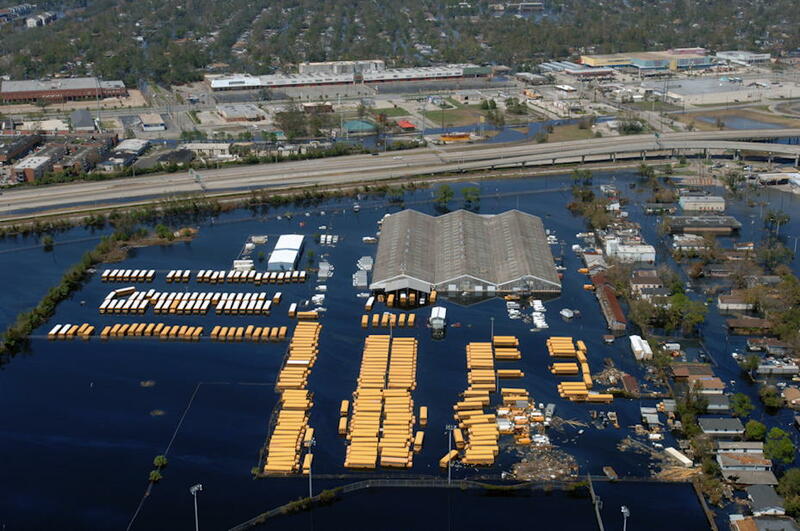 That picture represents how the mayor of NO, Ray Nagin, did nothing to evacuate the endangered parts of the city. Meanwhile, while some parts of NO were flooding, other parts were being looted … by the police! According to the WSJ (June 9, M1) Austin, Texas median prices for single-family homes “….has increased 48.2% from $250,000 in April 2012 to $370,600 in April 2017.” I do not have the figures but have heard that there are badly increasing property taxes. Texas, proud of its lack of an income tax, has a serious property tax problem, which the current governor is working on along the large power that cities have to annex against the wishes of the property owners. Such an annex just happened down the road. Someday there may be concern that these both are an unconstitutional “takings” of property by the government. There are many accounts of poorer people losing property, forced to inhabit inferior property and often to places more likely to flood, both inland and along the Texas coast. Developments sometimes further the problem, although there is a lot of work, not always successful, on flood control. A few weeks ago Corpus Christi had a downtown flood problem, submerging cars, from a short intense several inch downpour. It was a low area with a higher berm next to the bay. Climate, as in sea level, although important, is an obfuscation. “Climate Change policies” will hit Poor People harder than Rich People. Those who have it don’t want anybody else to “get it”. Greed is often what got it for them. (Sometimes they actually earned it.) Envy is what drives one to get what another has got. Pride is what drives both. Once you’ve got it, you have some extra to devote to pipe dreams. PS Hey, Leonardo, take a hard look at your motives. I’m pretty sure that higher energy and food costs (caused by insane “global warming” policies) will hit poor people very hard. Areas that are the most humid will see the least impact from so called global warming. As a result, the areas least impacted by CO2 will be the south east. The idea that poor people will be hit harder by changes in the climate, or by extreme weather events regardless of the cause, is simply true. It is true for the past, true in the present, and will be true in the future. Disaster prone areas have low property values (exception is highly desirable waterfront properties). The poor can afford these disaster areas and so live there. In the Dominican Republic, low lying river banks and extremely steep hillsides are covered with the homes of the poor, often built with discarded building materials, flatten oil drums, etc. When the storms come, the rivers rise washing the riverbanks clean of homes and sending the hillside homes sliding down into the valleys. In the aftermath, the government and foreign NGOs provide funds to rebuild the homes in the same disaster prone areas — to be washed away in two or three years time once again. The poor cannot afford to protect themselves from the weather — neither hot nor cold, nor rain, sleet, snow, or relentless sun and heat. The poor cannot afford to protect themselves from changing weather. Scoffing at this simple truth is foolish and heartless. Using this simple truth to promote not-useful climate change disaster stories is despicable. Everything hurts the poor more than the rich. That is just a fact of life. It won’t matter because the poor will always need the rich and the rich will always provide for the poor until the socialists run out of other people’s money. Nothing changes except the climate and it never stops changing.